Next year's version of the iPhone X could feature up to 10 percent more battery power if Apple and LG Chem are able to deploy a one-cell design for the device's L-shaped battery, as opposed to the two-cell battery used in the iPhone X, according to a report from KGI Securities analyst Ming-Chi Kuo that was obtained by MacRumors. 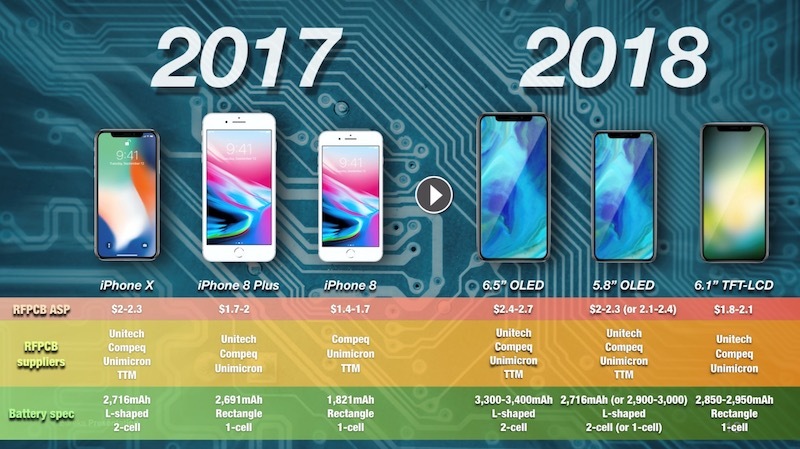 Kuo says the more space efficient one-cell design would allow Apple to boost battery capacity from 2716 mAh in the iPhone X to somewhere between 2900 and 3000 mAh for next year's 5.8-inch iPhone. As he previously claimed, Kuo believes Apple will release three new iPhones with TrueDepth cameras next year: a larger 6.5-inch OLED model that can be thought of as an "iPhone X Plus", a 5.8-inch OLED successor to the iPhone X, and a 6.1-inch LCD model. Today's report says that Apple is likely to use a two-cell battery design in the 6.5-inch model, but the larger size of the device will still allow it to have a capacity in the range of 3300 to 3400 mAh. With device space at a premium and a number of power-hungry components like the TrueDepth camera, however, it's unsurprising that Apple and its supply chain partners are pushing forward to develop a one-cell design to provide more battery capacity within the same volume. Translation: Next year's iPhones will be thinner yet, with same battery life. BREAKING NEWS! Better battery on newer version! I bet they come with a faster processor too. The next-generation product might be marginally better? Whoa! There is SO much wrong with this article. 1.) Not 10% more powerful. It would be 10% more energy. 2.) Apple can already make non rectangular batteries. They advertised it well with the 'terraced battery'. 3.) Apple does not need LG to do squat. They get most of their cells from revolving smaller Chinese suppliers. The issue isn't a technological one. It's cost. Non-rectangular cells mean that the electrodes cannot be 'wound'. This requires stacking electrodes which produces a lot more waste and requires a lot more automation. Maybe my reading comprehension is a bit off tonight, but don't those first two paragraphs contradict each other? 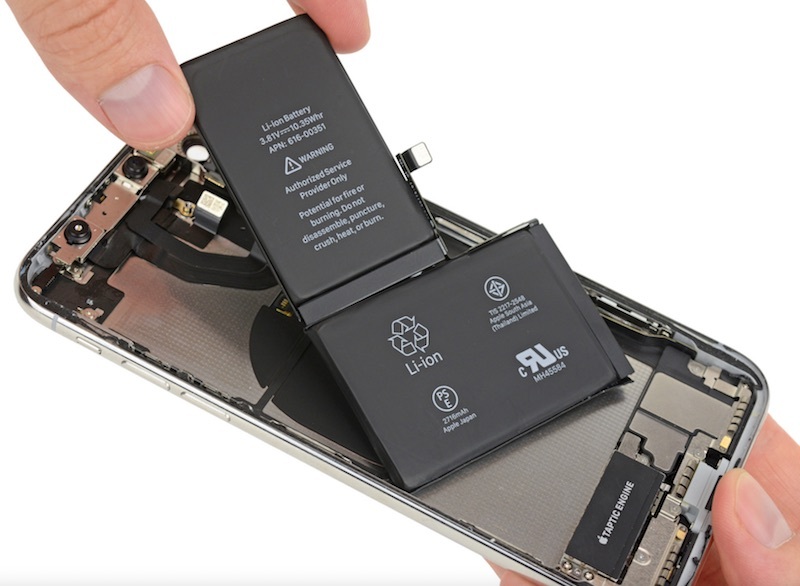 "...10 percent more battery power if Apple and LG Chem are able to deploy a one-cell design for the device's L-shaped battery, as opposed to the two-cell battery used in the iPhone X..."
"...the more space efficient two-cell design would allow Apple to boost battery capacity from 2716 mAh in the iPhone X to somewhere between 2900 and 3000 mAh for next year's 5.8-inch iPhone"
Some observers were surprised to see a two-cell battery inside the iPhone X when it was opened up by iFixit ('https://www.macrumors.com/2017/11/03/iphone-x-teardown-ifixit/') just after its launch, but there are technical challenges involved in producing non-rectangular battery cells, challenges Apple was unable to overcome in time for the iPhone X. If they end up using a two-cell battery again next year, we'll probably hear a string of Apple executives mentioning the talking point that they had never, ever intended to use a non-rectangular single-cell battery in the phone. Just make the battery bigger and don’t make the iPhone thinner. Problem solved! I wish phone batteries would last for days or even weeks instead of a few hours. I even bring a battery pack with me with the amount of times I have to charge my phone per day.